Hello friends! This week, the Paper Maniacs are using the awesome Northwoods Stamps which are on sale at Paper Maniac for 25% off! Also, we'll be trying to use our Spellbinders, too! Should be a super fun week! Here's my card this week. 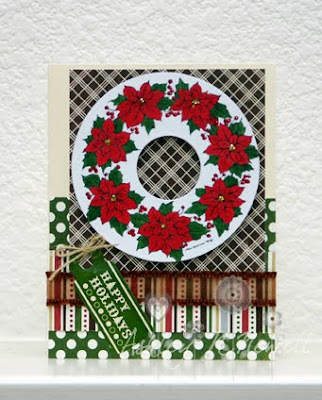 I used the Poinsettia Wreath stamp for this card. All the designer paper elements are from Echo Park Paper Merry Christmas. The ribbon and string are both from May Arts. I used my circle Nesties to cut the wreath out. This card is based on Jen del Muro's SFYTT this week.